This oceanfront restaurant glistens like a jewel while the menu features the freshest possible seafood. 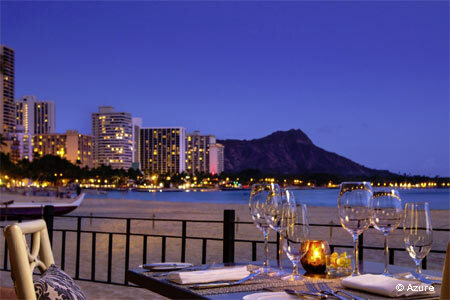 : The Royal Hawaiian's Azure presents a grandiose setting complete with tall columns, stone and wood materials, and Moroccan-style lanterns, not to mention a second-to-none terrace facing the Waikiki beaches. The menu features fresh seafood sourced from the daily Honolulu Fish Auction at Pier 38. Diners can order à la carte or opt for the five-course tasting menu, priced at $79 per person/$105 with wine pairings, which is a good value considering the impressive surroundings. It starts with a signature plate of sashimi: Hawaiian yellowtail ahi, Japanese hamachi, avocado and watermelon radish salad, and ginger vinaigrette. Other offerings might include Kona lobster tail risotto with marinated tomato, saffron and Waialua asparagus, and butter poached beef filet accompanied by mushroom, taro and brandy purée and a Madeira and black truffle sauce. Or, with two days' notice, guests can reserve one of the two oceanfront cabanas and enjoy The Royal Papa'aina (The Royal Table), an eight-course grand dégustation.